We are now taking enrolments for our 2½ year old sessions starting in August 2012. Whether it's to get your child familiar with the nursery environment, to get some jobs done or even for you to enjoy some quiet time, we can offer a broad range of pre-school experiences. Sessions:- Tuesday, Wednesday and Thursday. (Choose 1, 2 or 3 sessions). If you would like to visit us please feel free to contact us and we can arrange this. WICK staged a right royal celebration, befitting the Queen’s diamond jubilee achievement. And there was a heartfelt tribute from the town’s honorary Queen – its HarbourFest monarch. Abigail Jolly took an early opportunity after being crowned to mark the 60 years milestone. She said she was privileged to have been chosen to lead the celebrations, recognising Queen Elizabeth's "long and steadfast service to the nation". Afternoon and evening sessions on Tuesday 19th June. To mark Dementia Awareness Week, Alzheimer Scotland, Wick Services are holding their annual sponsored "Forget Me Not Trot - Memory Walk" on Saturday 23 June 2012. Starting in Market Square at 12.00 noon. Walk approx 10k around boundary of Wick. 5 Caithness Teenagers Continue Fundraising For "Children With Cancer UK"
The following letter has been received from a group of Caithness boys. I am part of a group of 5 young teenage boys that are fundraising for the charity 'Children with Cancer UK'. In 2011, we walked over two days from our hometown Thurso, 40 miles to the small village of Skerray. We did this in memory of my uncle Hugh, who died of Leukaemia in 1980. This was extremely successful as we raised a massive £1295.75. This year, we have decided to walk almost double that distance, and walk from Thurso to Durness, a total of 75 miles, in 4 days. You can follow the link below to see our story which was publicised last year. First batch of photos from the Vintage Vehicles Rally 2012 that took place on Sunday 10th June at John O'Groats. Names of cars wilbe added shortly where we can identify them. A further batch of photos willbe added later. Photos of some of the winners also coming soon. Kate Burt and Louise Shakespeare have set out to give some options to local Caithness people with certain health conditions. Tripudio Movement systems is a new movement and rehabilitation class starting in Caithness. A fun fitness and movement class that can be taken standing or seated. The class involves a specially designed warm up and cool down, named the 'flow', along with mobility, stretches and strengthening with gentle movements and dance to music. It is designed for people with health problems, e.g following or receiving treatments for cancer, lymphoedema, MS, arthritis etc, or simply overweight or as an initial gentle exercise class for those wishing to start regular exercise in a non-competitive environment. All the exercises can be done either sitting or standing. 25 years ago yesterday the BT switch room closed in Union Street. New technology advances changed the our telephone systems and staff were not required. Do you have any photos from the days in the BT Switch room or a night out in those final days. If so and you would like to share the memories send them to bill@caithness.org for publication on the web site. 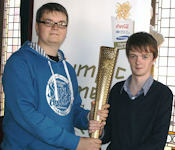 The Olympic Torch made its appearance at John O'Groats in the hands of Andrew Sinclair and Louis Mackinnon from Wick. Both men took part in the torch parade at Inverness on Saturday before heading north again. Civic Leader councillor Gail Ross acted as master of ceremonies to announce the lads as they arrived with the torch at the famous photo sign post and also to introduce a series of local musical items and dancers. A crowd of perhaps up to 3000 crowded into John O'Groats many of whom were earlier at the Vintage Vehicles show just at the nearby field for its annual competitions. Check The Whats On to see all the events up unitl the crowning of the Gala Queen next Saturday. This could be your chance to win tens of thousands of pounds. Infinergy's Inverness-based project manager Fiona Milligan describes the main features of the Limekiln wind farm proposal near Reay, Caithness, including changes made to the project in light of community feedback. The events in Reay village hall in Reay, Caithness, Thursday and Friday [May 24th and 25th] were attended by 50 local people. The open days gave people the opportunity to view and comment on the draft plans and the project team were available to listen to and answer questions. A 3D computer model of the site and its surroundings was available for viewing, allowing visitors to assess views of the wind farm from virtually anywhere. Since an earlier round of open days in March, Infinergy has refined its proposals for Limekiln. Those turbines closest to the village of Reay have been reduced in height and the number of wind turbines proposed has been reduced from 26 to 24. This will reduce the installed electricity generating capacity of the scheme from 78 to 72 megawatts (MW), but the site will still be capable of powering an impressive 36,000 homes – equivalent to 35% of all Highland households – and displacing around 80,000 tonnes of carbon dioxide per year. As part of the proposal, Infinergy is offering an industry-leading community benefit package worth £5,000 per MW – a total of £360,000 per year or £9million over the 25 year lifetime of the project. Infinergy has already convened the first meeting of a Community Liaison Forum around the Limekiln project, bringing together representatives from key groups including Caithness West Community Council, Caithness Chamber of Commerce and North Highland College UHI. Thurso Heritage Society in association with NHC Online has a unique and innovative project in the pipeline in which we wish to make largely unseen private archives accessible to all on a bespoke website. These collections contain a wide varied selection of items, from old photographs and films, to shop receipts from yester-year, maps, plans, books, ornaments, medals etc. This will be a great asset to the community, tourists, genealogists, historians, students, and education facilities like schools and colleges to promote and enhance the area. If you could spare 2 or 3 minutes to fill in our survey www.thursointeractive.co.uk it would be greatly appreciated to help get us started. Thanks in advance and we look forward to your comments. You may have an item relating to the Thurso Parish that would be of interest as part of this exceptional project. Please contact us through our website below and we can arrange to have it copied and safely returned with the appropriate credit. If you wish that the material is not displayed online but you would allow us to copy it for long-term preservation as part of a historical record this can also be carried out. You can also volunteer and get hands-on in this unique opportunity and receive free basic training on handling and digitising archive material. Please contact us at the below website. You are invited to help us in our lobbying efforts for a major improvement and modernisation of our rail line to Caithness and the Far North. Further details about recent exciting new local rail developments, which will greatly help make the case for improvements to our Line, will be revealed at our AGM. Following the visit of two Martial Arts Grand Masters to Caithness, local man Vince Tait has been graded to 5th Dan Master. KSD Martial Arts hosted the annual Northern Budo Alliance Bushi seminar in Wick where instruction was given by Soke Gunter Bauer, 10th Dan Hapkido (Grand Master), Soke Mark Kemp, 10th Dan Kempo JuJitsu (Grand Master), along with Kyoshi Neil Hourston 7th Dan (Master). 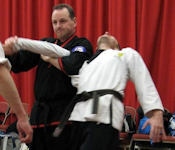 As well as the one-day seminar the two Grand Masters instructed at a regular KSD training session in Castletown and during the weekend KSD Chief Instructor Vince Tait was under intense scrutiny being graded to Master level. Following the award Vince said "This is a real honour for me and I am delighted to have been deemed worthy of being promoted to Master," Vince went on to say "I feel very proud, this is also a tribute to our club and the members who work hard as a team to support our activities". Two young men from Caithness have a number of "moments to shine" over the next few days. Andrew Sinclair (right) and Louis Mackinnon, both from Wick, attended the Olympic Media Briefing at Inverness today (Thursday 7th June 2012) and have been invited to take part in the BBC's Question Time, which is being held at Inverness tonight (Thursday 7th June 2012). On Saturday, they will be carrying the Olympic Torch on separate stages as it makes its way through the streets of Inverness. Andrew is first to run on a stretch on Glenurquart Road, near the headquarters of The Highland Council, while Louis is running the penultimate stretch across the River Ness and along Ness Walk. 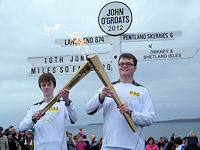 And on Sunday, they will be presenting the torches at an event taking place at John O'Groats. "A reminder to all of you out there, Laidhay Croft Museum is now open for the season. We hope lots of you will visit us over the summer and the sun shines for us all, at least for a reasonable amount of time!"